These days, I tend to think that the subjective evaluation of any laptop holds more weight than any specific benchmark. The reasoning is pretty simple: while you might see a difference in performance of a few percent with benchmarks, the actual experience of using a laptop day in and day out involves a lot more than raw speed. If you write a lot of emails or other office documents, they keyboard and touchpad quality will easily outweigh other aspects; photo or video editing – or just viewing images and movies – will benefit from a better display; and those that carry their work around benefit from the battery life, sure, but the build quality, dimensions, and weight of a laptop are also going to be critical. Thankfully, the ZBook 14 does very well in nearly all areas. Starting with the general design and aesthetic, HP is obviously going for a business class laptop with an understated design, and either you like that sort of approach or you don't. Most of the chassis is either dark gray or black; the top panel has brushed aluminum for the main center section with a soft-touch coating around the outside. I'm not really keen on the two-piece cover this creates, with a visible seam, but it's a minor point. The palm rest looks like plastic but it's actually a magnesium alloy; the same goes for the bottom. One cool aspect that stems from this being an enterprise laptop is that serviceability is a real consideration: a single latch on the bottom locks the cover into place, so you could remove the bottom cover and replace the RAM, HDD, and/or SSD in about two minutes if needed. And all of this is done without any apparent sacrifice in build quality, as the ZBook still feels solidly built. 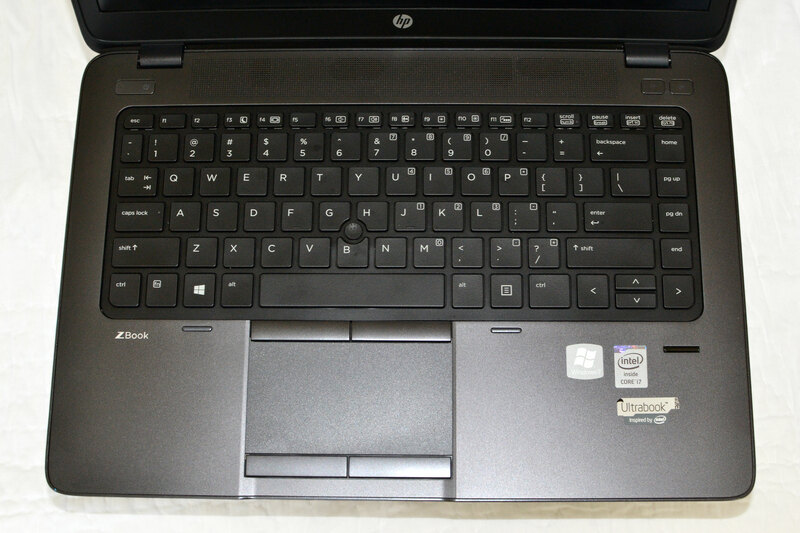 Moving on to the keyboard, HP provides a standard layout with dedicated document navigation keys on the right, multimedia functions accessible via Fn-key combinations along the top row, backlighting, and a good amount of key travel. It's comfortable to type on and about the only complaint I have with the layout is with the cursor keys – I prefer the inverted T that most other laptops (and desktop keyboards) use. That's a pretty minor complaint, and certainly there's nothing with the keyboard that would give me any real concerns. The touchpad story is similar; HP's decision to go with a standard touchpad (i.e. not a clickpad) with a TrackPoint nub in the keyboard is pretty common for business/enterprise offerings. Some people feel very strongly about the presence or lack of a TrackPoint, though I admit to being mostly ambivalent. I tend to prefer a straight clickpad personally – I didn't necessarily like them at first, but over the past couple of years I've come to appreciate what they offer, at least on the good models. HP does use a Synaptics touchpad, a LuxPad V1.3 to be precise, with a TouchStyk V2.0 for the TrackPoint, and they both work well. Multitouch gestures are supported, though of course being Windows 7 there's no support for the Windows 8 gestures. Again, like the keyboard the touchpad and TrackPoint do everything needed and I have no complaints. The display is actually one of the highlights of the ZBook 14, at least on the model sent for review. It's a 1080p IPS panel, and unlike the vast majority of laptop displays I've reviewed it actually appears to be factory calibrated – or at least it's far better than nearly every laptop I've reviewed, even before calibration. We'll get to the numbers later, but while the colors aren't necessarily perfect out of the box, the average Delta E before calibration comes in at 4.0 with the worst results only measuring around 6.0. Post-calibration, the colors are for all intents and purposes perfect. I can't say what the other display options are like of course, and given they appear to be TN panels I wouldn't count on them being in the same league, but for those that want a good display it's nice to see HP provides that option. The speakers are probably the weakest link in the design, and they're not the type that you can use to fill a room with sound if that's your desire. For presentations where all you need is basic audio, they'll suffice, but they don't get particularly loud and even then they can distort a bit at maximum volume in my experience. The integrated headset jack at least was free of static/interference as far as I could tell, so piping the audio out to a set of external speakers will easily shore up this shortcoming. HP provides some other extras that are worth mentioning as well, catering as you might already guess towards the enterprise market. The ZBook line supports a side dock connector, which works with the same ultraslim docking stations as the EliteBook 840/850 line as well as the Folio offerings. On the software front, HP provides their HP Performance Advisor tool, though I don't normally find that sort of software useful – it's just one more thing running, and I usually know well enough what I do and don't want on my system. More useful is the HP Remote Graphics Software (RGS), which features lossless compression with relatively low latency that can work over long distances. We didn't have a chance to try out RGS, but it's somewhat similar to tools like Teamviewer, and you get a free copy with any HP workstation. (Version 7.0 is coming in the near future, which will add additional features; version 6.0 is currently available.) You also get a Smartcard reader, Ethernet, full-size DisplayPort, and four USB 3.0 ports (I believe all four support charging while the system is asleep). One thing that is missing on the ZBook 14 is a Thunderbolt 2 port; the ZBook 15 and 17 have that, but apparently it didn't make the cut on the 14" model. Overall, there's plenty to like with the ZBook 14 design and components. If you're in the market for a business Ultrabook and you need a professional level GPU – even an entry-level model like the FirePro M4100 – your options are limited...in fact, to my knowledge this is the only Ultrabook with either a FirePro or Quadro dGPU. There are other slightly larger/thicker laptops that you could look at, but the major OEMs don't usually focus too much on thin and light mobile workstations. The downside, as I've noted in the introduction, is that the price of the ZBook 14 is pretty high, and most of the cost appears to simply come from the target market. Given the high quality screen and overall build quality, I could see charging a few extra hundred dollars, but that's not the way the enterprise market works. If you don't need the FirePro GPU and would be okay with a consumer grade GPU, the price is such that we can legitimately toss out the new Razer Blade 14 as a slightly less expensive alternative – and that's a $2400 system for the 256GB SSD model, which incidentally would also get you a quad-core CPU and a significantly faster GTX 870M GPU. Yeah. But does the FirePro M4100 actually give you a benefit over higher performance mobile consumer GPUs? I was actually surprised by how much of a difference the M4100 makes in professional applications, so let's get to the benchmarks. hitting the start button and sifting/digging through several sections to launch your program is so archaic. Even today, when using google, you start typing, and it auto fills suggestions, and starts loading results very fast. People love this. Now look at windows 8. You dont have to hit a start button, you just start typing. so if i wanna launch Microsoft Word, i type "Word" and by the r, it's already showing the icon to launch. "Now look at windows 8. You dont have to hit a start button, you just start typing. so if i wanna launch Microsoft Word, i type "Word" and by the r, it's already showing the icon to launch."